God opened the gates of heaven calling Alice home Sunday, September 25, 2016. Born October 1, 1921, in Portsmouth, Ohio, she grew up in Canton and Bolivar, graduating from Bolivar High School in 1940. Much of her adult life was spent living in Carroll County. 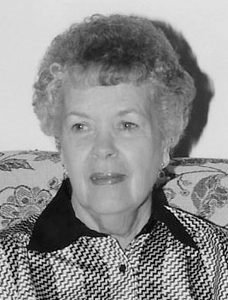 Alice was a member of Faith Family Church. She spent many years joyfully serving in the hospital ministry. Alice said she liked to encourage people, loving to tell anyone who would listen of God’s greatness. She was truly a special lady, brining out the goodness in everyone she knew. She is preceded in death by husband, Bernard McCaulley, Jr.; mother, Garnett Osborne; and father, John Booth. Alice is survived by daughters, Kathy (David) Lee and Barbara (Robert) Brugler; granddaughter, Laura Rinderknecht; and nieces and nephews. The family would like to thank the staff at the Inn at University Village, Massillon and St. Luke’s Nursing Home, North Canton, for those who cared for her during her illness. There will be no calling hours. A memorial service will be held with burial at Sunset Hills Burial Park, Canton, Tuesday, Oct. 11 at noon. Pastor Jack Tancher from FFC will officiate. Condolences and special memories may be shared at www.heritagecremationsociety.com. In lieu of flowers, please send donations to The Dementia Society of America. www.dementiasociety.org.